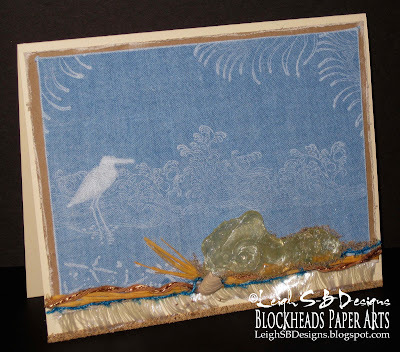 Velvet Paw Creations: "Beachcombing" Melt Art Sea Glass plus Fabric Stamping - Blockheads new Technique Challenge! 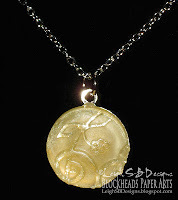 "Beachcombing" Melt Art Sea Glass plus Fabric Stamping - Blockheads new Technique Challenge! Greetings and Happy 4th of July week to you all! Today I'm combining two techniques into one fabulous beach inspired card! 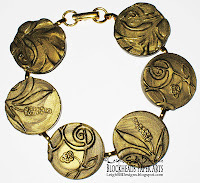 This one is the 4th installment in my adventures into Melt Art PLUS I also incorporated the current Blockheads Technique Challenge which is Fabric Stamping! I've also got 2 versions of the same card to show you too! The first one demos stamping on fabric with just white ink for a sun-bleached effect and the second is coloured with a few touches of Distress markers. 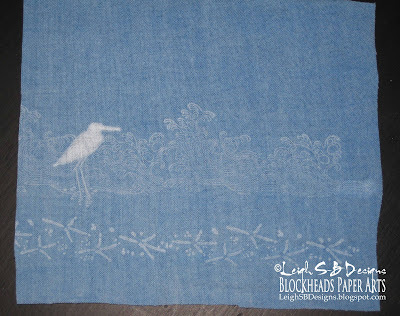 Before we get started I want to tell you about Blockheads Fabric Stamping Technique Challenge! We've made a little change to the challenge set up that will make it easier for you guys to participate! Before you were required to include the html blog hop code into your post, now you don't have to if you don't want to. 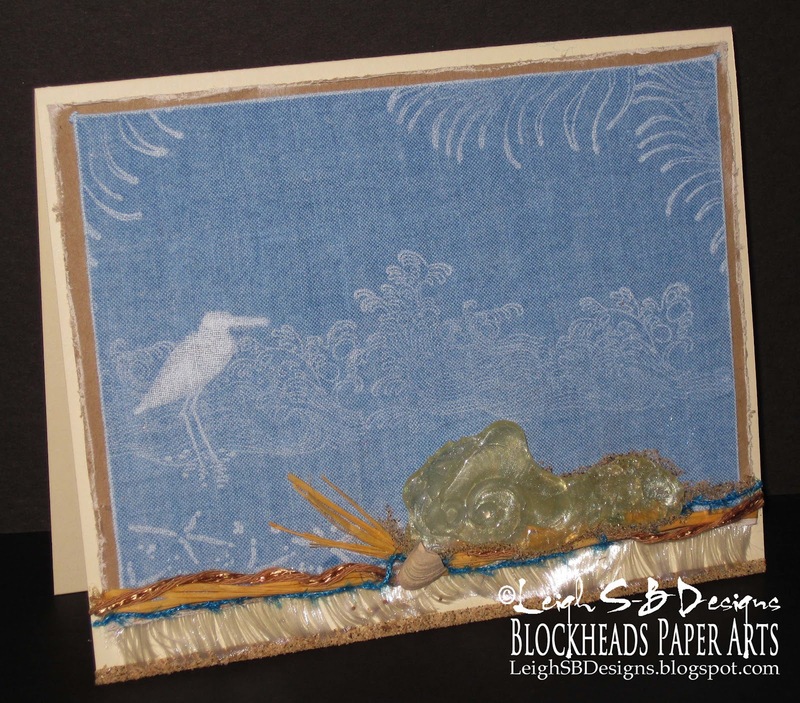 Enter the Blog Hop Challenge for a chance to win a $25 gift certificate or submit your project to Blockheads Facebook group if you don't have a blog for a chance to win your choice of a 4" x 5" cling mounted stamp set! Visit Blockheads Fabric Stamping Technique page on their website and check out Karen's wonderful tutorial on how to go about stamping on fabric. Everything you need to know about entering the challenge is on that page. Then enter the challenge on the Blockheads Blog. 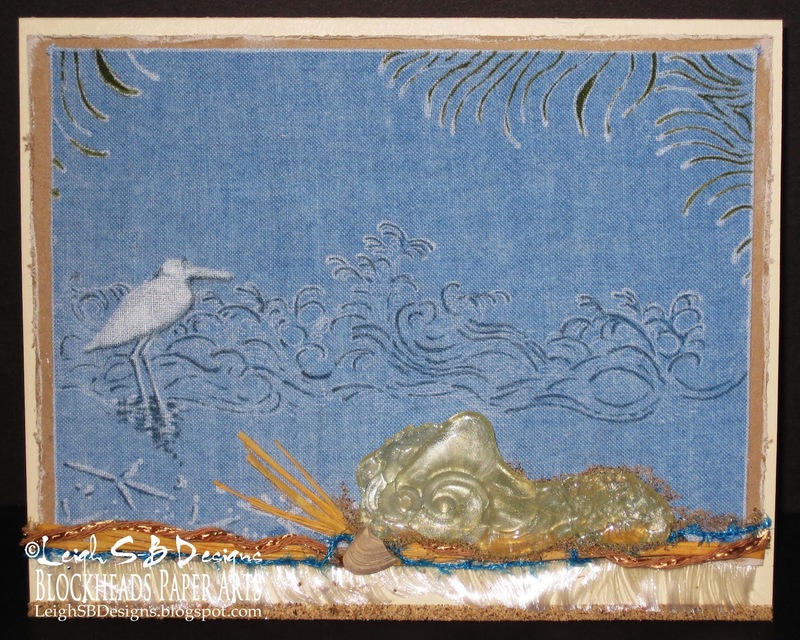 But before you dash off have a peek at my take on the Fabric Stamping challenge with a faux sea glass Melt Art embellishment! To create that wonderful sun-bleached effect I did all my stamping with VersaMagic Cloud White ink. VersaMagic is an archival multi-surface chalk ink that is perfect for stamping on wood, fabric, leather, metal and dries on all types of paper. The stamped impressions don't migrate and detailed images remain crisp. 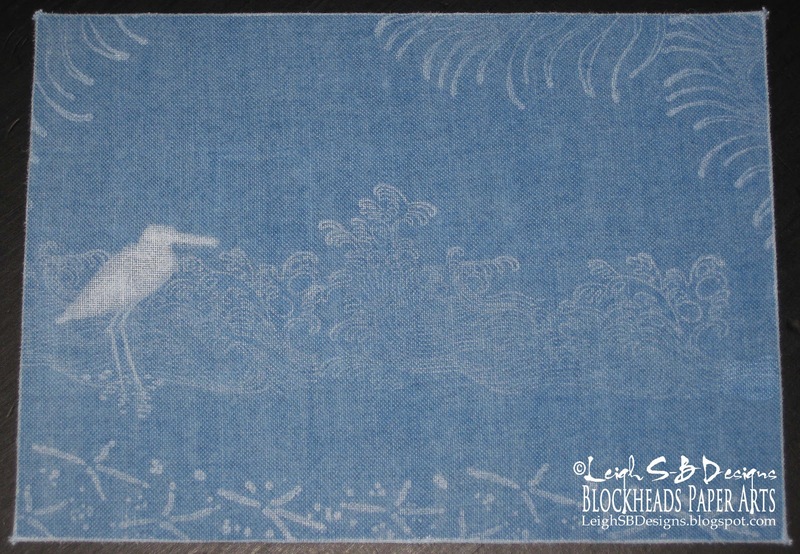 Lightly ink up the waves stamp (Chinese Princess set) for a more subtle effect and stamp it three times across the middle of the fabric. 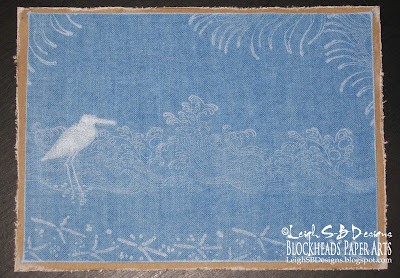 Apply more ink to the bird paw prints image (Frogs and Nature set) and stamp it three times across the bottom edge. Stamp the peacock feather image (Proud As A Peacock set) three times along the top edge so it looks like foliage peeking in along the sides. Stamp the bird image (Frogs and Birds) with a heavier ink application. Even though the ink is opaque I applied even more ink to the bird with a Q-tip to make it stand out more. 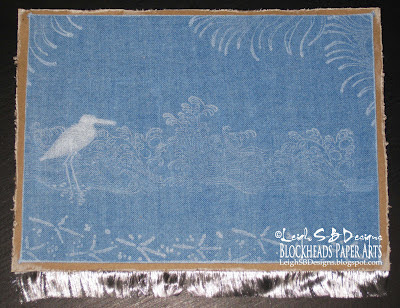 Recycle some heavy weight junk mail cardboard for the base of the fabric and give the stamped panel a wrapped canvas feel. Trim the cardboard and run it through a Xyron to add permanent adhesive to one side. Apply the fabric panel to the cardboard and adhere the edges to the other side with double sided tape. 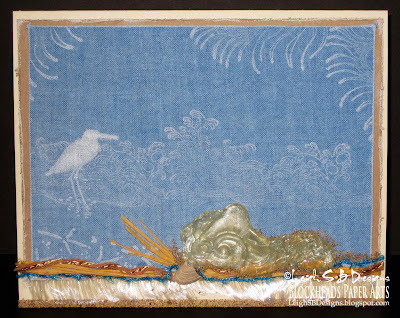 Apply Cloud White ink to the edges of the wrapped panel for a worn thread bare look. 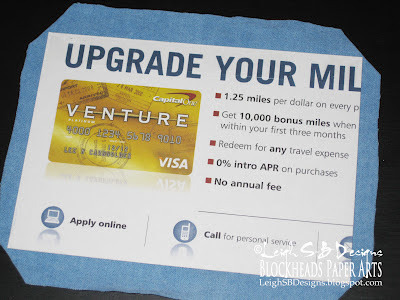 Cut a mat from light brown cardstock, distress the edges with Tim's Distress Tool and apply Cloud White ink to the torn edges. 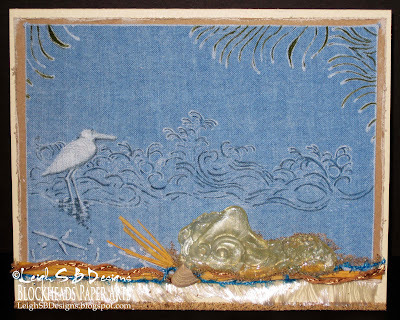 Adhere the fabric panel to the mat with craft glue. Adhere a length of silky white fringe fiber along the bottom back edge of the mat with double sided tape. The fringe reminds me of frothy white sea water washing up on the beach. Adhere the ends of a length of tan coloured raffia to the back of the mat with double sided tape, cut it in half and tie in a knot. Fray the ends and adhere the knot to the card front with a glue dot. Top Tip Tuesday Tip: Now for the Melt Art part of the project! If you're like me you probably hate wasting things so here's a tip on what to do with the dregs of UTEE left over in your Melting Pot once you've finished using it. 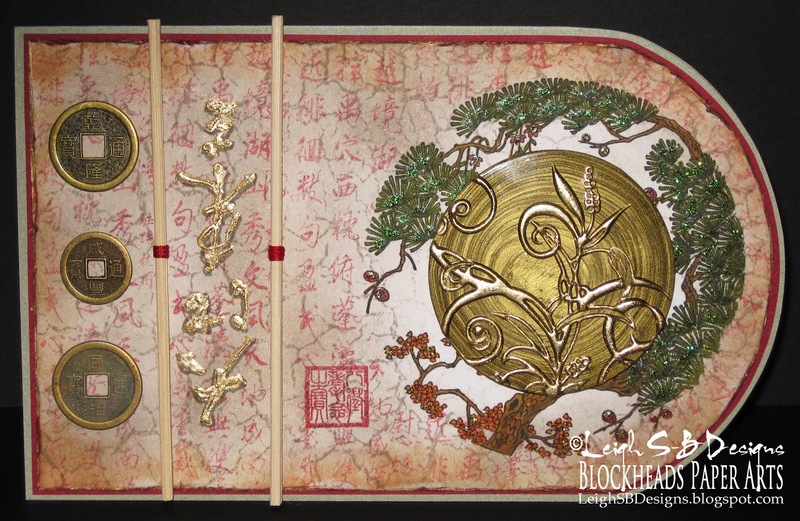 I've been working on a series of Melt Art projects for Blockheads Paper Arts demoing the new Texture Treads by Ranger. 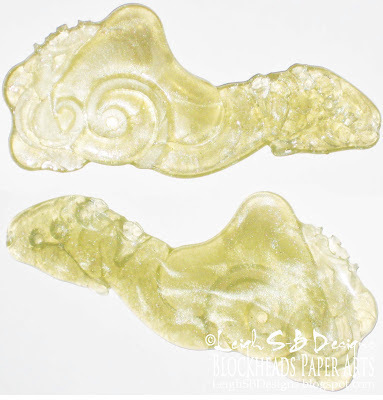 After making some clear UTEE pieces I wanted to switch over to gold and I got the brilliant idea of making faux sea glass with the left over clear UTEE. I'd already added some Pearl white Perfect Pearls powder to the molten UTEE and for my faux sea glass I also sprinkled in some blue and green Patina Perfect Pearls to get that greenish-blue sea glass hue. You can see the pearlescent shimmer in the photo above and you can kind of make out some green-blue inclusions too. Once the powders were mixed I poured the clear UTEE out directly onto the Floral Flourishes Texture Tread and allowed it to form a random shape. 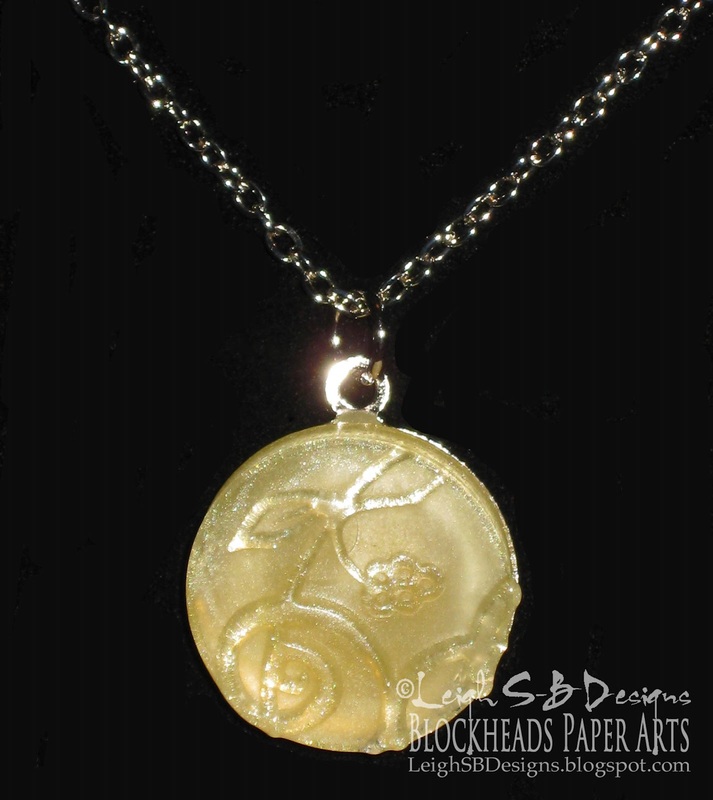 Totally looks like sea glass don't you think! Check out Part 1, Part 2 and Part 3 of my Melt Art Series if you missed those projects! Back to the card...Make a top fold card from pearlescent light yellow-brown card and adhere the stamped panel to it with craft glue. 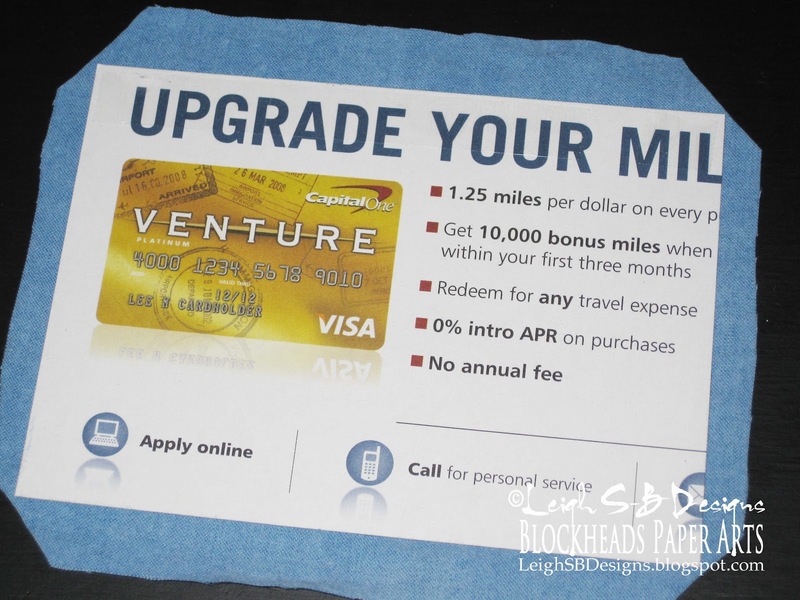 Run a strip of 1/4 inch double sided tape along the bottom edge of the folded card and adhere beach sand to it. 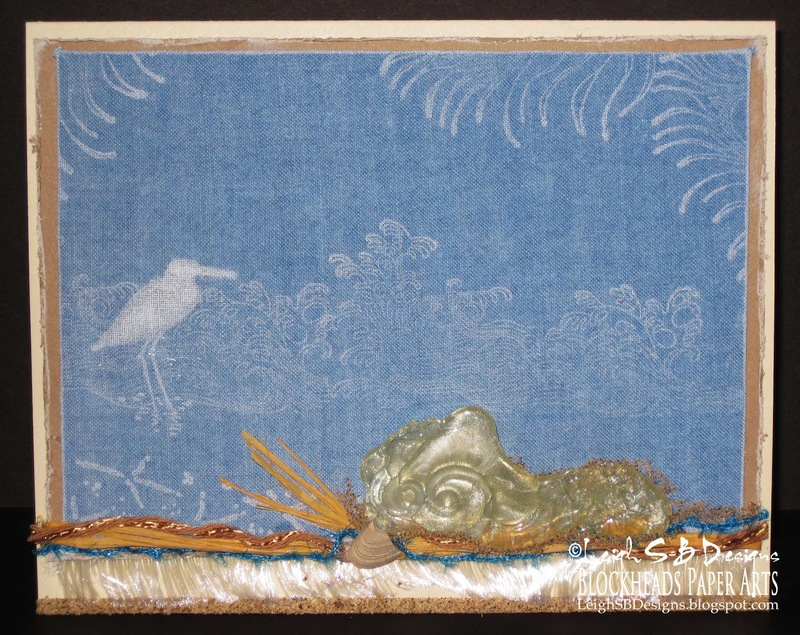 Adhere some brown fiber with gold thread mixed in along the bottom edge with craft glue - the brown fiber reminds me of drift wood, and add some shimmery blue fiber for water. Adhere the faux sea glass to the card with clear dimensional foam tape. Apply some clear craft glue around the UTEE embellishment with a tooth pick and sprinkle on some more beach sand. Finish off with a small piece of a broken shell and you're done. Or you can take it further and give the sun-bleached scene a touch of colour with Distress markers! Blockheads is now stocking the individual markers if you want to just pick up a few to try! Add some shading to the bird to give it more dimension and add a touch of colour to the waves with Weathered Wood and some colour to the greenery with Peeled Paint Distress markers. Top Tip Tuesday Challenge #80 One for Men - Top Tip - what to do with the dregs of UTEE! Lol! Loooove the recycling bit! Fantastic card! Thank you so much for joining us at Make it Monday! Don't forget to leave a comment for another entry and mention you saw them on MIM for a chance at our second prize! Good luck! 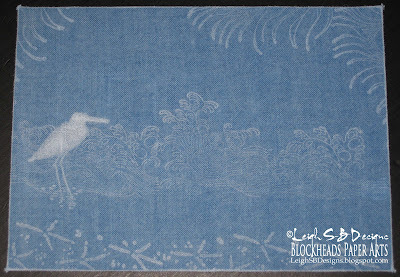 Love the way the white ink looks on the blue fabric. Great use of the shorts!! I love fabric like that that has been laundered over and over. Super project!!! ooh what a lovely card! Thank you so much for playing along at the CBN network challenge this week.. Hope to see you again soon! Wow, Leigh, this is phenomenal!! Absolutely beautiful! Wonderful combination of the two techniques! What an amazing project, this is just so different. Great use for old shorts too! Very arty. What a great card! And awesome techniques! Thank you for playing at Smudgy Antics anything goes challenge! Super little beachy scene I love it! Love the sun bleached effect on yourcard! I saw it on Make it Monday!